The next volunteer workday at Dyfed Permaculture Farm Trust will be on Sunday 13th October, 10am until about 4pm. 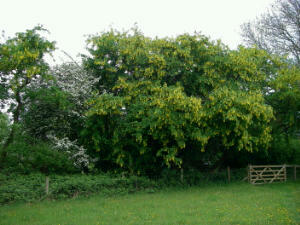 This month the plan is to coppice some aged laburnum trees to rejuvenate them. The aim is to do the work using hand tools. We have recently received a grant from Environment Wales to purchase tools, so now have some high quality hand tools, such as a cross cut saw and bilhooks, available for volunteers to use. We will also be looking to make maximum use of the resulting timber eg looking for pieces suitable for use as fence posts. Workdays are a great way to visit the Trust, meet like minded people, share your skills or learn new ones. There is usually a lively conversation going on throughout the day covering a wide range of topics and, of course, there is the delicious bring and share lunch! All are welcome to join us. Please bring work gloves and a contribution for lunch. This entry was posted in Volunteer Workdays and tagged coppice, Permaculture, volunteer. Bookmark the permalink.